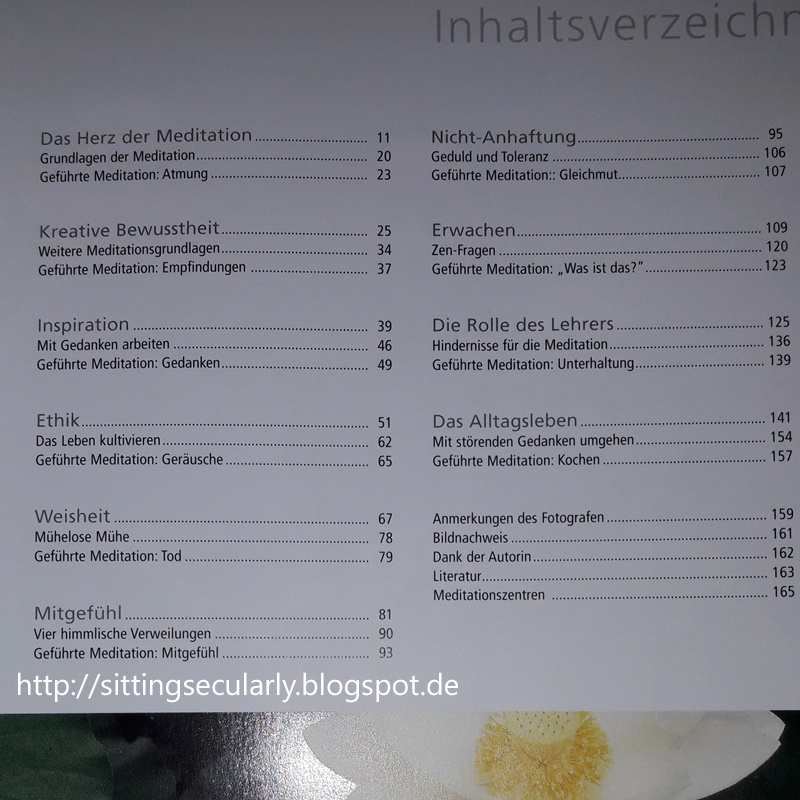 *[DE] Inzwischen gibt es zahlreiche Angebote von Meditations-Kursen und -Retreats. Die Schwierigkeit liegt darin, einen Kurs zu finden, der zu einem passt, das heißt, er sollte für mich eher traditionsungebunden sein, und örtlich erreichbar sowie zeitlich wahrnehmbar sein. Gar nicht so einfach (wenn man auf dem Land lebt). Glücklicherweise gibt es inzwischen Meditationskurse, die man online wahrnehmen kann. Hier möchte ich die Möglichkeit vorstellen, an einem solchen Kurs bei realizemedia teilzunehmen. *[EN] Meanwhile, there are numerous offers of meditation courses and retreats. The difficulty lies in finding a course that is the right one for you, i.e. for me I prefer it to be rather not bound by any tradition, and finding a course that is within reach locally and that can be attended in your spare time. Not that easy (when living in the country). Fortunately, there are meditation courses one can attend online nowadays. I would like to tell you about participating in such a course with realizemedia. 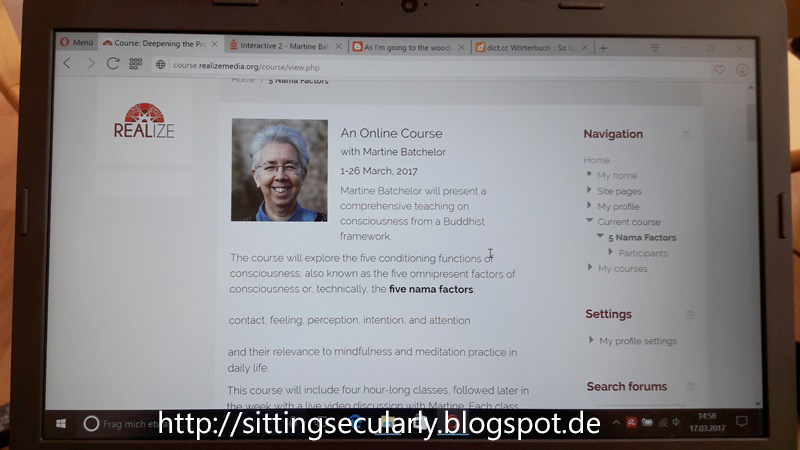 *[DE] Nachdem ich ein Buch von Martine Batchelor gelesen habe (mehr dazu weiter unten), habe ich mich dazu entschlossen, an ihrem Online-Kurs "Deepening the practice, exploring consciousness" teilzunehmen. Wie funktioniert also so ein Online-Kurs? Jeden Mittwoch im März werden bei diesem Kurs einstündige Lehrreden von Martine online gestellt (verfügbar als Online-Video sowie als Audio-Download). Sie befassen sich mit jeweils einem Thema und am Ende gibt es eine zehn- bis fünfzehnminütige geführte Meditation. Jeden Sonntag im März treffen sich die Teilnehmer aus aller Welt in einem Chat. 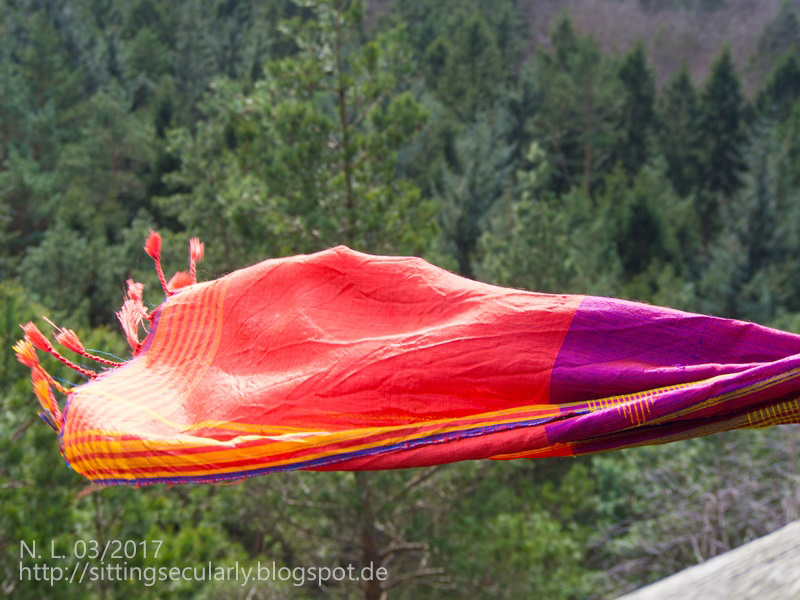 Dort können sie der Kursleiterin, hier Martine Batchelor, Fragen zu den Lehrreden und Meditationen oder auch allgemeine Fragen stellen. Die Fragen werden dann per Audiostream beantwortet. Außerdem gibt es ein Diskussionsforum, in dem sich die Teilnehmenden austauschen können. Bei diesem Kurs bietet Martine sogar an, auch hier unter der Woche Fragen zu beantworten. Ich finde es empfehlenswert, das es eine gute Gelegenheit bietet, von renommierten Lehrern zu lernen. 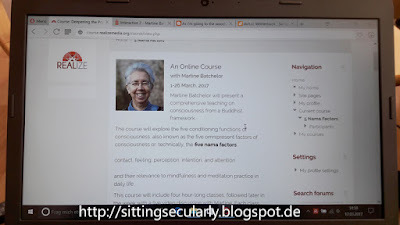 *[EN] After reading a book by Martine Batchelor (more on this below), I decided to participate in her online course "Deepening the practice, exploring consciousness". So, how does such an online course work? Each Wednesday in March 60 minute teachings, including guided meditations, are launched online (available as online video and audio download). Each Sunday in March the participants from all over the world meet in a chat room where they can ask the teacher, here Martine, questions on the teachings, meditations or they can ask general questions. Furthermore, there is a discussion forum for the participants. In this course Martine even offers to answer questions in the forums during the week. I think a course like this is recommendable because it is a good opportunity to learn from renowned teachers. *[DE] Martine Batchelor führte 10 Jahre lang das Leben einer Zen-Nonne in Korea, später ging sie mit ihrem Mann Stephen Batchelor nach England. Dort lernte sie die Vipassana-Meditation (Theravada) kennen. 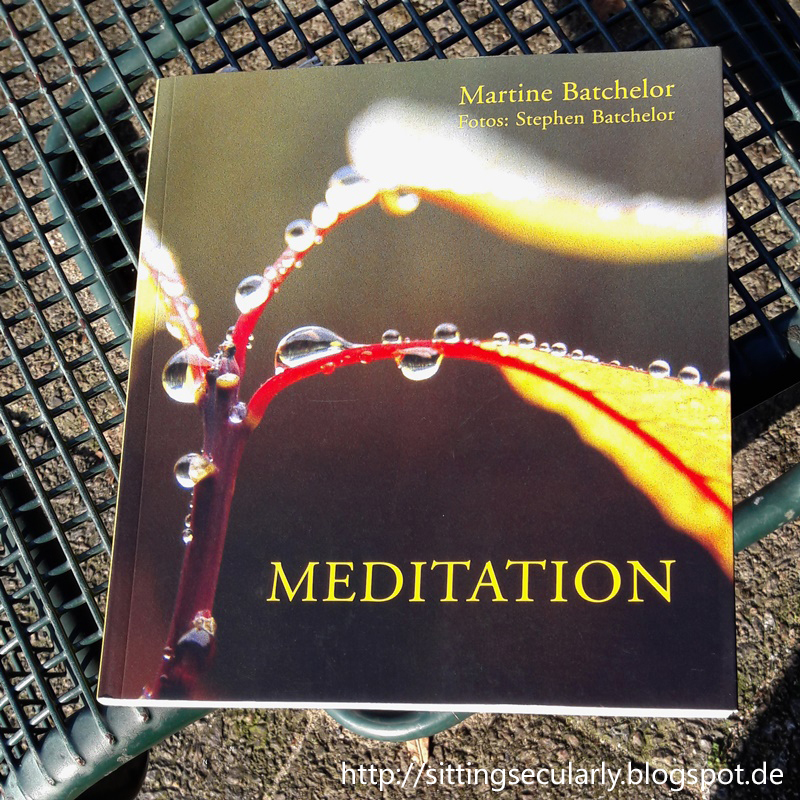 In ihrem Buch "Meditation" stellt sie Praktiken aus der Zen-, der Theravada- und der tibetischen Tradition vor. Das Buch ist eines meiner Lieblingsbücher zu dem Thema, da es verständlich und undogmatisch ist, lebhafte und humorvolle Anekdoten aus Martine's Leben und gute Praxistipps enthält. Jedes Kapitel beschäftigt sich mit einem Thema (z. B. Ethik, Mitgefühl etc.) und endet mit Hinweisen sowohl zur formellen als auch zur informellen Praxis und einer geführten Meditation. *[EN] Martine Batchelor led the life of a zen nun in Korea for 10 years, later she went to England with her husband Stephen Batchelor where she became acquainted with the vipassana meditation (Theravada). 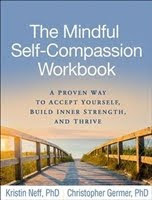 In her book "Meditation for life", she presents practices from zen, theravada and Tibetan buddhism. The book is definitely among my favourites on this topic as it is intelligible and undogmatic and because it contains vivid anecdotes from Martine's life as well as good hints on practice. Each chapter deals with one topic (e.g. ehtics, compassion etc.) and ends with suggestions for both formal and informal practice as well as a guided meditation. "Gebrauchen Sie bei der Meditation Ihren gesunden Menschenverstand. Passen Sie sich je nach Umstand an oder lassen Sie los und hüten Sie sich davor, Dinge allzu ernst zu nehmen oder übertrieben fromm zu werden." "Use your common sense. Adapt yourself depending on circumstances or let go and beware of taking things overly seriously or becoming devout over the top."